Read TINY TOWN, my latest piece in Cincinnati Magazine (click on Vidhya Nagarajan's illustration above). Click on the pic for maps and directions to New Richmond on the Ohio. New Richmond continues to celebrate the town's bicentennial (1814-2014) with art -- both visual and musical -- food, wine and the colors of autumn. Artists will sell & demonstrate their work along Front Street with the scenic Ohio River and the vibrant hills of Kentucky as their backdrop. Bluegrass legend Katie Laur, Julie Stinchcomb, Steve Free, Generations, Eden Park Duo and Ricky Nye will perform. Click on the above picture for directions to New Richmond. Wine tastings from local vineyards Harmony Hill Wines and Meranda-Nixon and La Vigna Estate Wineries. Lotsa great music on Sunday's show including Jerry Douglas' latest project, The Earls of Leicester -- a super group composed of Tim O'Brien, Charlie Cushman, Johnny Warren, Shawn Camp, Barry Bales and Douglas in tribute to Flatt & Scruggs. Click on the image above to go directly to our playlist and -- if you want to own or gift some tunes -- please consider clicking on the Amazon link under each song. It won't cost you a penny more, but will benefit this great radio station, WNKU. Pssst: Playlist displays in reverse order. 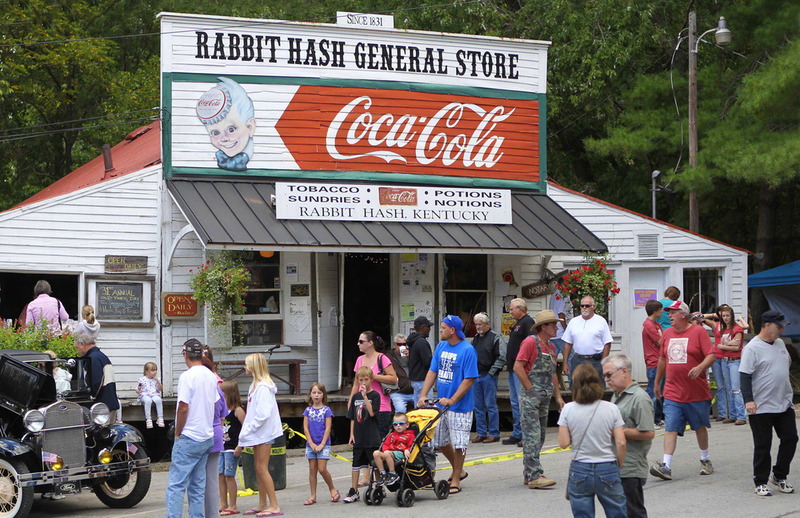 AGAIN WITH THE RABBIT HASH! 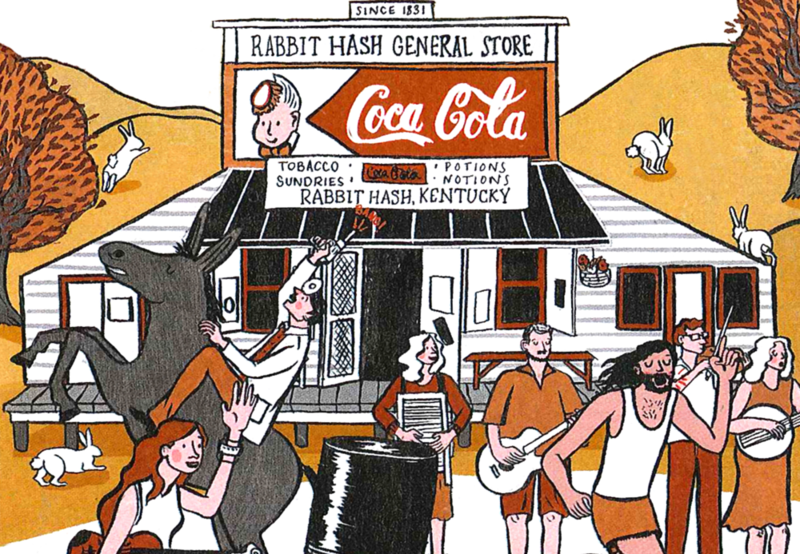 My latest piece for Cincinnati Magazine is about one of our favorite places, Rabbit Hash, Kentucky. You can pick up a copy at your local bookstore or newsstand. 'Course, we'll have a link to it once it's posted on the Magazine's website at the end of the month. In the meantime, we thought you'd enjoy revisiting a poem by Walleye Stevens, written upon the occasion of a mayoral election in the tiny town. Rabbit Hash first gained national attention when it's citizens elected a dog as their mayor and pretty soon every critter in town was running for office. Click on the black bar (above) to hear us read the poem on our broadcast -- and follow along as you listen. As Republicans are used to wear. Line the floor with last week’s newspapers. Let fly the electoral slapdash. The only mayor is the mayor of Rabbit Hash. And gather it so as to collar his neck. To piddle-stream the Purple Ash. WNKU's recent Fall Membership Drive was one of our most successful in years! And, among our most popular "Thank You" gifts were the three cases of Feast Here Tonight Vienna Sausages (by the way, that's "Vi-eeny Sausages," down home). For those who had to settle for the Earls of Leicester CD or a T-shirt, we wanted to give you a "taste" of what you missed (above). As it says on the label, "Made with rabbit and twisted briar in log broth." THE GIBSON BROTHERS SING "EASTBOUND TRAIN"
You may know the song from the Flatt & Scruggs recording and Mac Wiseman immortalized his own take on his latest CD, Songs in My Mother's Hand. Dock Walsh recorded the first "hillbilly" version on Oct. 3, 1925, but the song traces it's origins to an older tune called Going for a Pardon, copyrighted in 1896. Going for a Pardon was written by James Thornton who composed popular sentimental ballads for the early vaudeville stage. He's best remembered for his most enduring hit, When You Were Sweet Sixteen. Click on the banner above to read my recent piece for Cincinnati Magazine. If you're not already a member of WNKU, please consider joining us Sunday evening for our Fall Membership Drive. You can call 1.855.897.1059 or log on to the WNKU site and select the Support WNKU tab to get to the Become a Member page. To be honest, we're more concerned with numbers of people than with numbers of dollars. Any way you wanna do it. Any amount is appreciated. Just be sure to say that your supporting MUSIC FROM THE HILLS OF HOME. Mr. Lyle Quarles of Tepid Spring, KY spent his working life painting barns — “CHEW MAIL POUCH," “SEE ROCK CITY” and, every now and then, a clothing store or car dealer closer to home. Lyle is also a loyal listener to MUSIC FROM THE HILLS OF HOME and, when he heard our Fall Membership Drive was coming up, he decided to show his support the best way he knew how. Now, we’re not asking you to paint your barn, but we would appreciate your call between 6:00 & 9:00 PM on Sunday, September 21. ANY PLEDGE — big, little or in the middle — helps WNKU continue to share great music. And if you can’t join us for the show, you can become a member by going to the WNKU website and selecting the “Support WNKU” tab. Just be sure to mention MUSIC FROM THE HILLS OF HOME when you sign up. I had to look twice to see J.D. Crowe in this little u-tube clip, though there was no mistaking the rat-tat-tat of that banjo. Moon Mullins used to say when a banjo player was good it was like a “hen peckin' corn out of a No. 2 washtub.” J.D. Remains on top of the banjo world though I think Joe Mullins is coming up behind him. I wish I were young enough again to sit at the Red Slipper Lounge at the Holiday Inn in Lexington, Kentucky, to listen to J.D., Tony Rice, Ricky Skaggs, and Jerry Douglas play some very fine bluegrass music. It hooked me, and I've been listening ever since. Lotsa great music on Sunday's show including Gonna Catch a Train, the brand new single from the latest CD by The Spinney Brothers. Click on the image above to go directly to our playlist and -- if you want to own or gift some tunes -- please consider clicking on the Amazon link under each song. It won't cost you a penny more, but will benefit this great radio station, WNKU. Pssst: Playlist displays in reverse order. BTW: The nifty illustration above is from an exhibition of sheet music, album covers, instruments and audio that brings together two distinct eras in American history -- the Civil War and the civil rights movement. The show, entitled Revolutions: Songs of Social Change, was presented by the Virginia Historical Society. Lyrics from Hop High -- or, Uncle joe, depending on how you first encountered the song -- are embroidered into Marianne Worthington's poem, Barn Dance Costume (see below). This song dates back to the early 1800s in Scotland and Ireland before finding its way to our shores...and our mountains. Poet Marianne Worthington in front of John Lair and the Cumberland Ridge Runners featuring Linda Parker, "The Sunbonnet Girl," who was born in Covington, KY, just across the Ohio River from Cincinnati. Marianne Worthington's "BARN DANCE COSTUME"
During April (National Poetry Month), we shared works by a number of Kentucky poets: Wendell Berry, Frank X. Walker, Marianne Worthington and others. Marianne Worthington is a poet, educator and editor whose talent has been recognized by numerous awards and fellowships. She is a founder and editor of Still: The Journal and keeper of her own blog, Fixing to Shout & Sing. Check out her entry on the women of country music and her other writings about her Appalachian Music Fellowship experience. The Berea College Appalachian Music Fellowship for 2009 allowed Worthington to explore the Library’s Department of Special Collections and Archives to study the likes of Lily May Ledford, Cousin Emmy and Linda Parker. Here, she discovered how completely the on-air persona of each woman was “groomed” by the men who produced the shows in which these artists performed. Costumes, words, songs, names and biographies were dictated by the producer in an effort to concoct a character that conformed to the strict gender roles that could be handily sold to sponsor and listener alike. Emblematic of this process was Linda Parker. Parker was born Genevieve Muenich in Covington, Kentucky, but grew up in the shadow of the steel mills of northern Indiana. By the time she was 20, she was singing in the nearby saloons of Chicago. She was soon “discovered” by John Lair, producer of The National Barn Dance, who transformed her into “The Sunbonnet Girl” by dressing her in gingham and replacing her blues repertoire with songs of the Carter Family. As “The Sunbonnet Girl,” Parker became enormously popular. Not three years into her fame, she was on tour with other Barn Dance performers when she died suddenly from appendicitis. She was 23. Even in death, John Lair continued to managed her mythology. He told news outlets that, taking a cue from one of Parker’s popular ballads, she was buried beneath a weeping willow. WLS was flooded with mail and for the year that followed, “Bury Me Beneath the Willow” was one of the most frequently requested songs. Marianne Worthington wrote the following poem about all of the women who served as each producer’s personal pygmalion, but especially about Linda Parker. and leave your calico behind. The Barn Dance Costume first appeared in Kudzu (2014) and is reprinted with permission from the author. 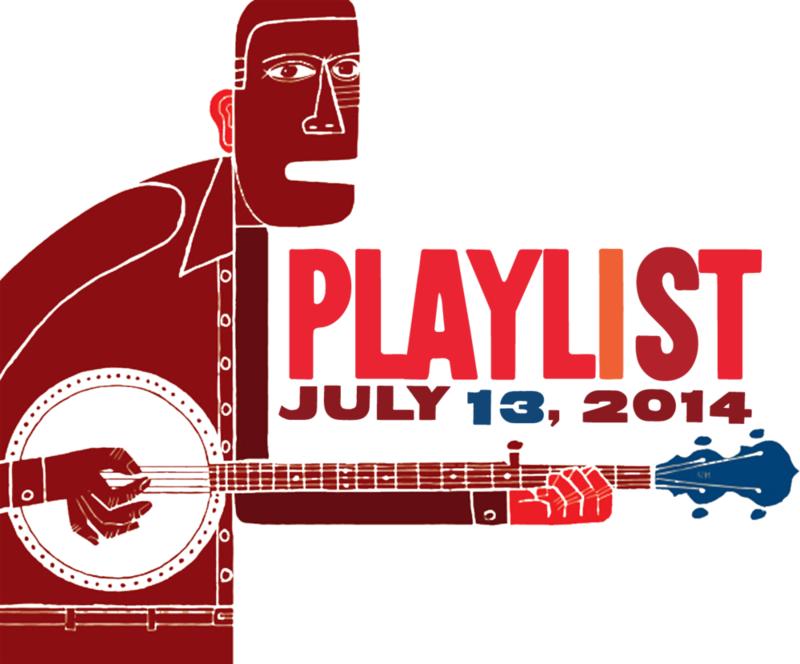 Lotsa great music on Sunday's show including Bitterweeds, the brand new single from Larry Sparks' forthcoming release. Click on the image above to go directly to our playlist and -- if you want to own or gift some tunes -- please consider clicking on the Amazon link under each song. It won't cost you a penny more, but will benefit this great radio station, WNKU. Pssst: Playlist displays in reverse order. In the fall of 1958, the Stanley Brothers recorded Train 45 for King Records here in Cincinnati, Ohio. 54 years later, while in town to perform as part of the MidPoint Music Festival, Ralph Stanley and his band -- including James Allan Shelton -- took time out to shoot a Michael Wilson video at the grand ole Emery Theatre. Ralph Stanley was still serving in the Army when his brother Carter got out in 1946 and joined The Blue Ridge Mountain Boys, a band run by his brother-in-law, Roy Sykes. Roy lent Carter his Martin D-28, the very guitar Carter is holding in the picture above (far right) as he poses outside the WNVA radio studio in Norton, Virginia in the summer of 1946. James Alan Shelton (profile, second from left) is holding the same guitar as he tunes up for the video shoot. He had only recently acquired the instrument from Roy Sykes, Jr. trading, "...another Martin guitar plus a rather large sum of money..."
The D-28 needed some restoration -- a neck re-set, some set up work -- "It has a large scratched up place on the top where Carter dug it out with his fingerpick." Shelton added, "I do not take it out on the road a lot, but occasionally I will because I think something like that should be shared." Sadly, we lost Mr. Shelton on June 3rd. Thankfully, this gifted artist recorded many performances to sustain us in his absence. Enjoy James Alan Shelton as he shares his prized guitar and, more importantly, his music along with his fellow Clinch Mountain Boys and the good Dr., his own self. One mic for Ralph, one mic for the band and one camera to capture the whole thing in one take. And, if you appreciate all kinds of music, treat yourself to more of the Emery Sessions. Our friends at KET (Kentucky Educational Television) are presenting week-long bluegrass buffet featuring the new, must-see documentary entitled Powerful: Bill Monroe Remembered. Pete Wernick called the film, "...beautifully shot and edited stories from his stunning cavalcade of sidemen." The film features interviews with more than 60 former Bluegrass Boys including Earl Scruggs, Jimmy Martin, Bobby Hicks, Del McCoury, Peter Rowan and airs this Tuseday, June 10 at 9:00 PM, EDT. Click on the banner above to check out my most recent piece in Cincinnati Magazine. We play prit'near anything we like. To know I’ve Christ within. I can't remember all the words exactly, but how innocent that little song is, and performed in their brother harmony, it sounds absolutely G R E A T!! At the same time, Oakley and I have started to weed out old records: ones I never played, some that have lost their lustre or should have been filed in punk rock. Altogether we have disposed of about 100 CD's, and we still have several nights' work to go. “This isn't just spring cleaning,” I said to Scot this past Tuesday night, topping off a crate of CD's and sneezing from the dust in the air. “I think the show is morphing into another animal, and I can hear the sound in my head, but I can't name it or list the elements it will have.” One of the biggest requests I get is to podcast the show. I'd like to see that happen, and though the costs to re-broadcast the music are high, I'd like to explore the possibilities of original programming. The possibilities ahead shimmer with promise, yet after 25 years on the air, I'm fully aware of the downsides ahead of us as well. I may not always be the driving force of our time slot, but secretly I hope the show will go on, even without me. 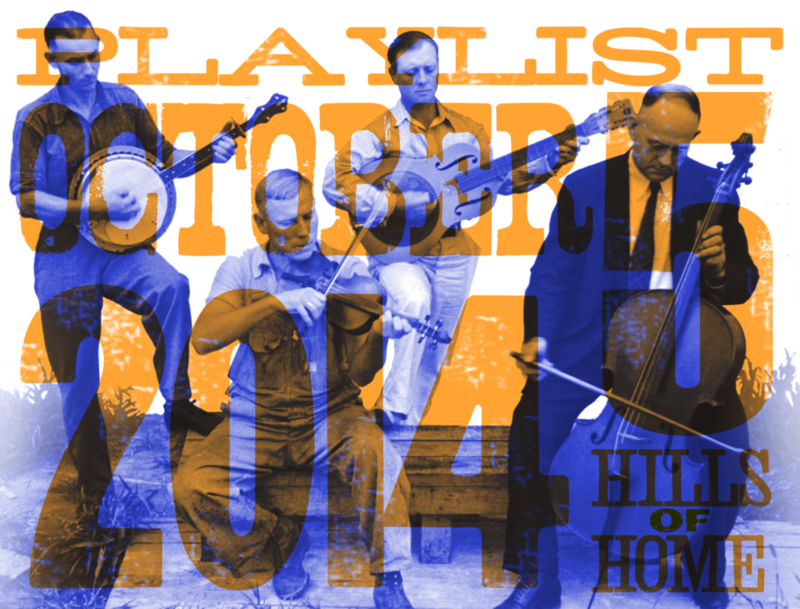 Music from the Hills of Home has outlasted a half-dozen station managers, almost as many formats, even several episodes of the rise and fall of acoustic music. Last Sunday my friend Becky, who lives in San Francisco and listens on her computer, wrote me an e-mail saying she was glad that I was back on the air, that she was back on the couch listening to me, and that for a little while all was right with the world. I smiled at that and reminded myself to take baby steps every day. Oakley Scot and I are putting down new roots in what we hope is hospitable soil. Chris Pohlar and my own self(ie) at the most recent gathering of the "Leftovers" at Ruth's Parkside Cafe in Cincinnati's vibrant Northside neighborhood.